Bombay High Court Notification is out. Bombay High Court is recruiting for 199 Senior System Officer And System Officer Govt Job Posts. You can check Bombay High Court - Bombay High Court last date, download Bombay High Court notification, visit Bombay High Court official website and check other Bombay High Court Vacancy details.Complete Vacancy and recruitment Details about 199 Senior System Officer And System Officer Govt Job vacancies in Bombay High Court are provided below by JobSarkari.Com only for you. Last Date for Apply Online. 26/02/2019. Senior System Officer Candidate Must Have Passed Must Degree of B.E./B.Tech. In Computer Science / Engineering or Information Technology or Electronic Engineering or Equivalent Qualification with 05 Years Experience. Candidate Must Have Passed Additional Certifications Like MCSE (Micro Soft Certified Systems Engineer) / RHCE (Red Hat Certified Engineer) or Equivalent Qualification and RHEL (Red Hat Enterprise Linux) 40. System Officer Candidate Must Have Passed Degree of B.E./B.Tech. In Computer Science / Engineering or Information Technology or Electronic Engineering or Equivalent Qualification with 01 Year Experience. Candidate Having Additional Certifications like MCSE (Micro Soft Certified Systems Engineer) / RHCE (Red Hat Certified Engineer) or Equivalent Qualification and RHEL (Red Hat Enterprise Linux) 159. Total No. of Post 199. For General/OBC Maximum Age 40 Years. For SC/ST Maximum Age 45 Years. 3. Candidate Are Required to Fill All the Details in Application Form And Need to Upload All Mandatory Documents. 4. Candidate Need to Apply Online Before 28th February 2019. Q. What is the Last Date For Bombay High Court Senior System Officer And System Officer Govt Job Vacancy ? A. 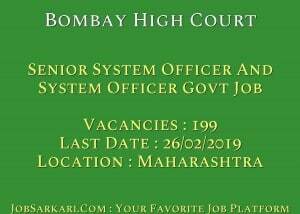 Last Date for Bombay High Court Senior System Officer And System Officer Govt Job Posts is 26/02/2019. Q. 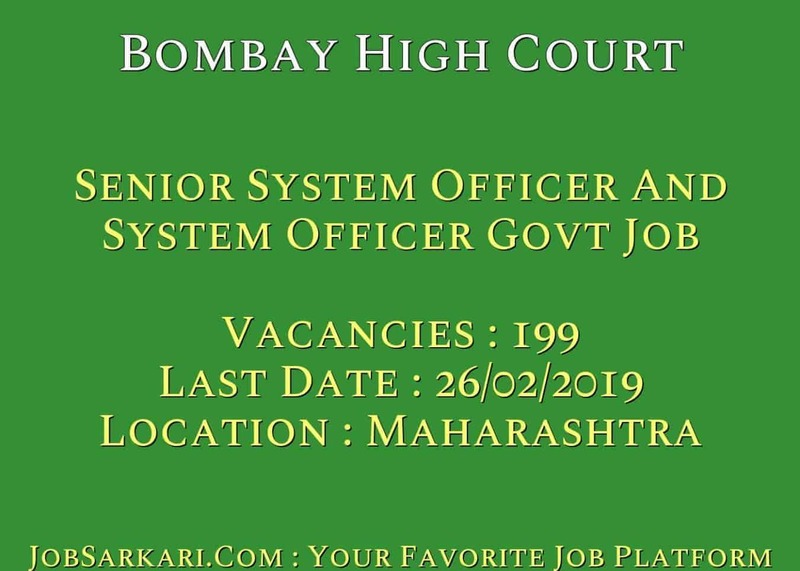 What is the Form Type of Bombay High Court Senior System Officer And System Officer Govt Job Recruitment ? A. The Form Type for Bombay High Court Senior System Officer And System Officer Govt Job Posts is Online. Q. How many vacancies are available in Bombay High Court Senior System Officer And System Officer Govt Job Posts ? A. There are about 199 Vacancies in Bombay High Court Senior System Officer And System Officer Govt Job Posts. Q. What is the Full Form of Bombay High Court ? A. Full Form of Bombay High Court is Bombay High Court .